This article may not interest everyone, it is about typing in ‘Tamil’; a language existed over 2000 years. Yet some of the points may fit for the people who types in multiple language. Android has many keyboards including the Google’s own. The stock version of your phone’s keyboard may vary based on the phone’s make. Sony, Samsung and few other manufacturers has their own keyboard app set as default. The keyboards I am going to list out and compare are those on the top of line which can be fit in to any android device regardless of the make. Google’s own keyboard, satisfies all the basic requirements of a keyboard, nothing more and nothing less. The keyboard is snappier and the design is cool after the latest update (Lollipop). The personal dictionary syncs across all of your devices even in web. Coming to ‘Tamil’ typing you need to configure from input settings and select appropriate language you want to load up. To switch between the languages you have to load up the global menu from notification drawer or else by continuously pressing the space bar. Either option loads up the global menu of input options which is bitter. Prediction and spell correction for Tamil is bad, yes BAD. It only predicts/corrects the words you previously typed in the past. Pros : Free, Simple, Sleek, Faster. Cons : Switching language through global menu, inadequate spell correction and no prediction of new words. Top rated keyboard app in Play store and managed to hold that place for long time. Recently made as a freemium. I personally using it for the last 4 years. In the recent update 12 new languages were updated (most of them are Indian languages). 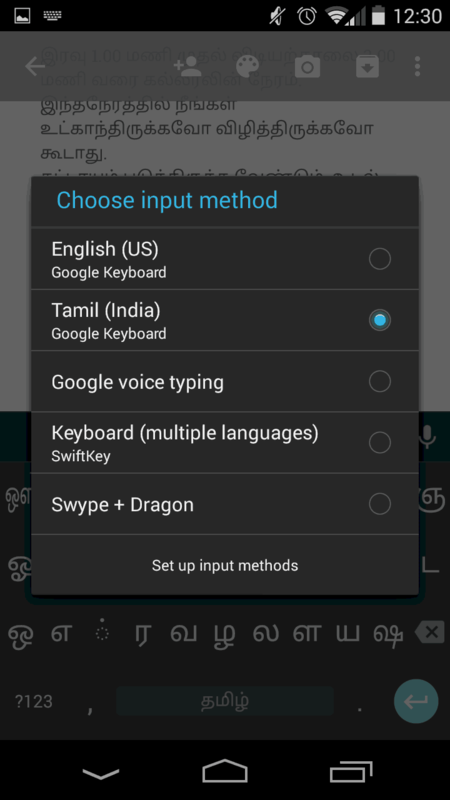 The key layout for Tamil language in SwiftKey is like qwerty for English. If learning curve is too much steeper for this layout as I was used to the normal layout for long time. 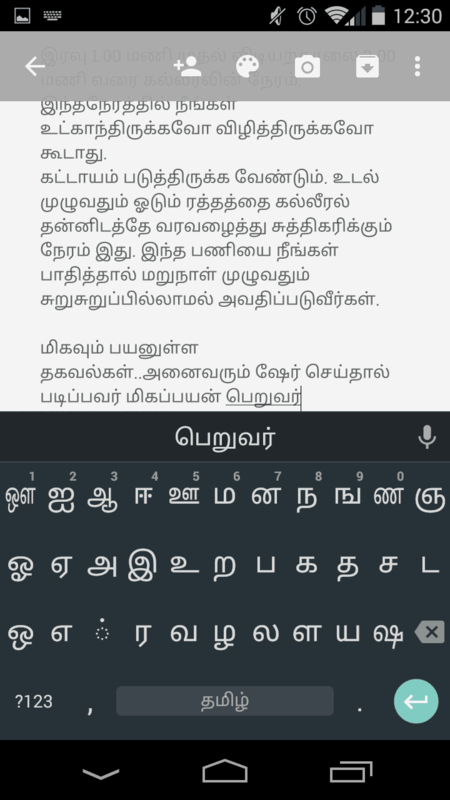 When I cross verified other Tamil keyboard layouts nothing is same as this layout. The frequency of using ‘Caps Lock’ button or ‘long press’ for selection of characters in underlying layers are very high. This slows down my typing speed for Tami. Comes to English it is too damn good in all the way. Spell correction and prediction for English is too good especially with the “Trending Phrase” option checked in the settings, however for Tamil it is marginal. As the prediction works for only three possible options you have to type longer for better prediction. 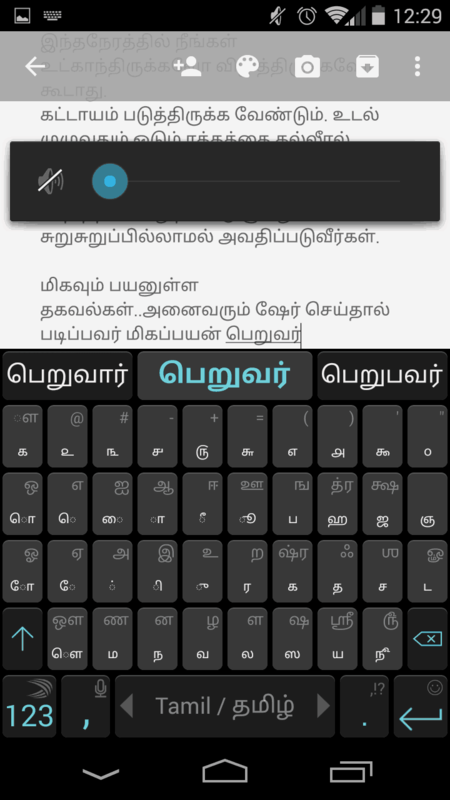 Swipe input is not a good option for Tamil typing. The extra-ordinary feature I admire about this keyboard is ability to predict and correct words even in multiple language at same time. You can understand the last point in screenshot below, see the English Keyboard even predicts/corrects the Tamil word. It’s truly a multi-language keyboard. Switching between the languages were a swipe away on space bar. Pros : Freemium, Speedy, Personal Dictionary on Cloud Syncs across devices (available for iOS), multi-lingual typing. Cons : Prediction options are limited to 3, spell correction is not working as expected, ‘Swipe to input’ option doesn’t work as it works for English. 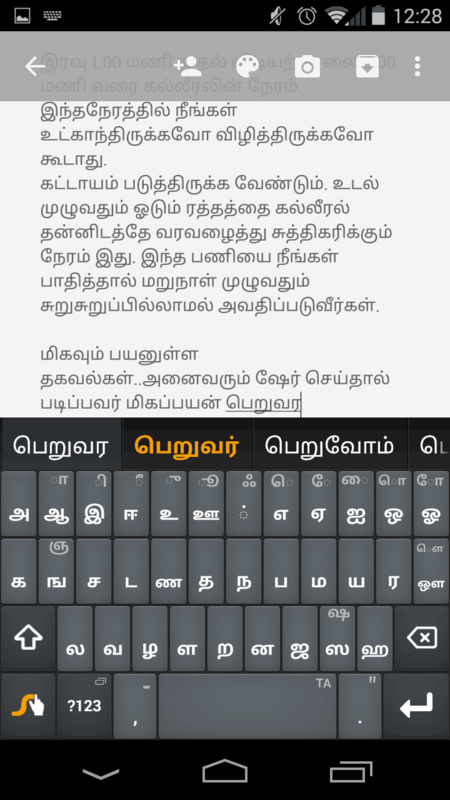 Pros: Speedy, Neat Ordered layout, Better prediction, better correction, Swipe input for Tamil, dictionary sync across device. Cons: Premium (free for trail), No multi-language at same time.